Why was fire important enough to be in CM1, but chosen to be tactically unimportant and left out of CM2? Global warming - Battlefront was an early signatory to the Kyoto Protocol. Difficulty of programming. BF has stated that before. The Pyro in me would sure love to see it added. Fire is in CM2. A burst of .50 cal tracer rounds sets fires where it lands. The floor of a building that's been heavily fired on (pun not intended) can be covered in flames. If you include items scheduled for future modules there is/will be about a dozen different versions of flamethrowers across the titles. Can you burn up buildings and burn down forests? No. Nor do I want to engage in such activities! ok, then let be more specific , the aftermath caused by explosion or flamethrower, burning and spreading of fire is not in the game, the randomness of fire is not in the game, it was in 1999, 20 years later its not doable?Im not understanding, Im asking why that part of fire is not in the game?Does BF not think its worth the time? is it a business descision on their part or it just cant be done? OK, got it now.....I like fire too, but one thread is plenty. ok where?whats the answer ? I don't remember it being officially answered. And I don't think it's sufficient as is. I was under the impression that little fizzle we get for a minute or so was the precursor to them adding the full effect into the game (WAY back when). If you want a middle-ground compromise keep the effect we have now and give it a percentage chance of getting bigger depending on weather/ground conditions and quarantine it to the tile it starts in. There are plenty of solutions that could be made to combat the worn out argument that every player just wants to burn the map to the ground. I've always found that argument to be a cop out. The flame is there, they gave it a length of time, extend the length, extend the size, that would be enough for immersion. And don't anybody come at me with it not being visually realistic etc. because we still got guys that disappear into thin air when they are shot on/in vehicles, tires that don't role on AT guns, tanks that drive through each other, etc. so I think we can get away with bigger fire sticking to one tile. IIRC something from Steve - a factor was limiting it due to gamey abuse. Could have been to prevent area / building denial by starting fires by means under players control. it could get quite extensive in CM1. I dont like if (i dont know that to be factual)BF is concerning themselves with "gamey abuse".There are plenty of things to abuse if one chooses to.I believe fire is essential to realism and immersion for CM and is a crucial element for complete realism in warfare.It was in there original game.Its in ASL, the tactical grandfather of all. Anyway, I agree with @weapon2010. Gamey tactics isn't a great argument. There are much worse ways to game the system than fire starting. Map edges, recon by jeep, recon by sound etc. They are still in the game. We aren't really asking for much (at least I am not), all I am asking for is to increase what is there now. I'll even go a smaller compromise, keep the little fires burning much longer. There are a lot of things that should be in this 12 year old game that still haven't made it in. Priorities I suppose are to blame. You can class this under 'Be careful what you wish for'. A burning forest or city block (and your framerate plummeting to the single digits) doesn't really sound as much fun as you might imagine. I'm reminded of that Simpson's episode where Homer gets to design his 'Ideal' car. He adds so many absurd gizmos and features to it that he creates a monstrosity and bankrupts the company. I'm sure particle effects and area damages can be reasonably optimized. This is a feature that has been missing in action either way. 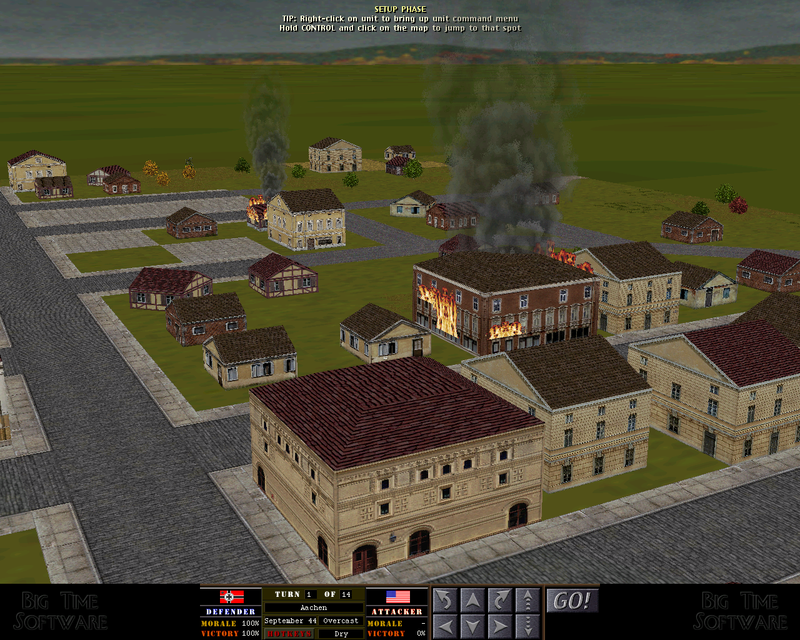 Urban combat is very simplified already with houses with no rooms or basements and generic windows. There's no reason fire can significantly affect performance once applied to that system if it's optimized and/or simplified properly. I think Graviteam is on the right track. Buildings can be set on fire, and I believe individual trees as well. However fires don't spread across forests afaik. Well, if it does ever come back into any of their games, having fire will need to be different than how it was in the CMX1 series. Because trying to portray it somewhat realistically did allow for gamey play. Too many battles where wheat fields became excellent denial zones to the enemy. (I recall a few battles where I created such a bottleneck for the attacker to have to go through, they had no way of advancing because all my fire power was too much for any force to be able to realistically break through). So spreading fire would have to be limited more and intentional fires is almost totally unavailable, unless there was a way to penalize a player for using it inappropriately. Graviteam is a very bad example to use for what CM should do, I won’t even consider shelling out for that game. One the problems I could imagine with adding larger fires in the game would be its dynamic nature, also coupled appropiately with smoke plumes. CMX1 I think had LOS/LOF resolution more broadly on the 20m tiles and it could be something way different for CMX2 8m tiles and 1m resolutions in true 3D. Fire/smoke beeing dynamic could be quite a burden on LOS/LOF calculations, if many additional calculations need to be made in each calculation chunk and all on map units spotting etc. involved. I have no concerns with anything beeing gamey when it comes to large fires in the game. There´s also other means to make (parts of) buildings inaccessible, but I´d wish more for a better visual presentation. Like damaged roofs not making the entire buildings upper story inaccessible. Movements through windows (basement), more/better roof access I´d prefer before having large fires in the game in any case. Edit: Doesn´t all mean these can´t be included in a future vastly improved game engine (V5 onwards) though, but in current V4 it doesn´t make that much sense ATM. Boy oh boy oh boy, does this picture bring back memories..
And to be honest? It most probably has given me way more fun and excitement than CMBN/CW/MG/BS together. Not because those games don't satisfy me, no. But because way back then CM1 was a mind blowing experience. Unique. Amazing. Nothing like I'd ever seen. I'm desperately waiting for Victory to Rome, which I suspect is very near the release date, and I really hope the campaigns are as playable as the scenarios in Cm1. With or without fire..
Look at all things graviteam games don’t do versus CM and you will find your answer young Jedi. I love playing the Graviteam games. But they are so much more limited in scope that any CM game going all the way back to CM1's early days. I find the tactical battles have a more realistic feeling. It has a kind of cool operational layer. But the battles, units, maps, etc. are very limited compared to any CM game. But they put out numerous patches, updates, and new modules quickly at a very reasonable price. And they add new features all the time through patches. 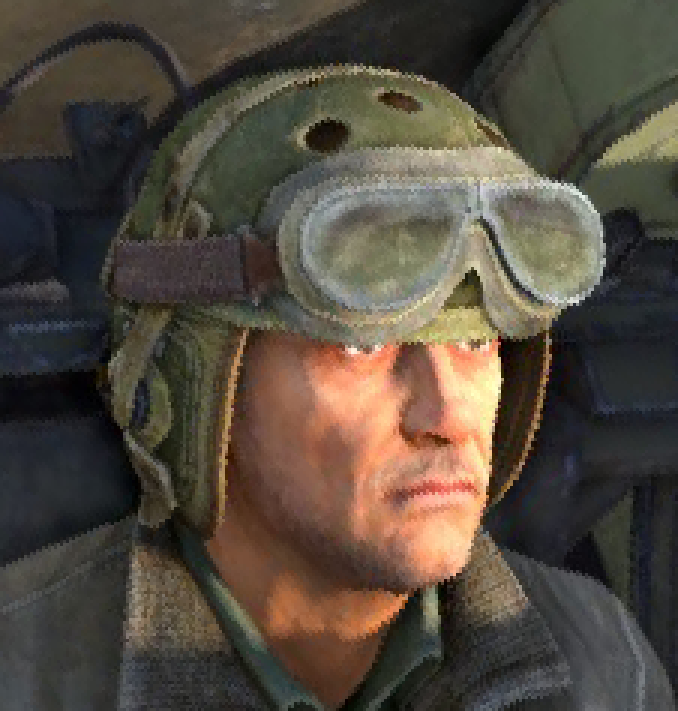 With that said, anyone who likes playing CM and won't even consider the graviteam games isn't a wargamer, the are a CM gamer. Or they are a war gamer unsatisfied with graviteam games. Not all games are for everyone fortunately we have choices. I play with a very infantry centric view in CM. Graviteam doesn’t scratch my itch.